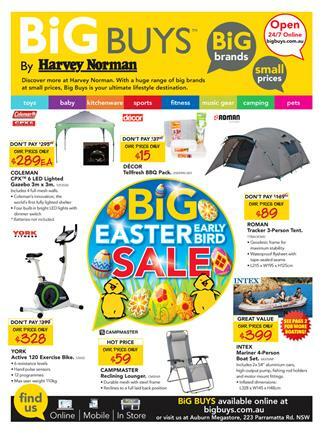 Entertain your holiday with Harvey Norman Easter Catalogue products which are tents, camping chairs, ensuites and sleeping bags, coolers, toys, bikes and many more entertainment products for kids and family. Easter holiday must be happiest in March 2015. With latest Harvey Norman Catalogue published in second week of March you can reach a lot of products. Especially camping products made me curious about entire catalogue. Big Easter sale of Harvey Norman catalogue will keep big amount of your money in your pocket. Harvey Norman offers new tents for camping possibly most people decide to make in this holiday. Coleman tents, domes, sunwall and similar products are sale on pg; 2&3. Outdoor items such as pet house, boat set and other necessary products you would need in new season can be ordered in the official page of Harvey Norman. Of course one of the most popular products are those of toys for Easter. Kids love gifts picked from toy sales like this one. Great toy brands and popular figurines of super heroes can be seen on the new catalogue. On bigbuys.com.au you can purchase kitchenware and musical instruments that are also viewed on pg; 14&15 of the latest Harvey Norman catalogue. Check out these new products to catch a wonderful price range in-store and online. Amazing electronic range of Harvey Norman with the new catalogue is available at the moment. New sale by Harvey Norman Catalogue is available on the preview page. 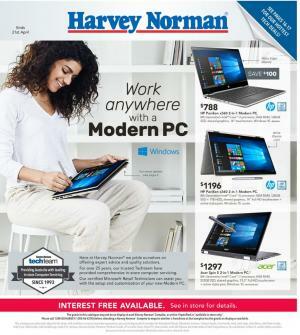 Easy to browse new Harvey Norman Catalogue March 2015: just click image of the cover of the catalogue. Electronic deals are heavily highlighted on new sale of Harvey Norman. Notebook sale of products with Intel processors, high volume of HDD and SSD and high performance RAM units. Very good products that you can use to do your daily home works and office works are featured by the catalogue. Variety of tablets are available on pg; 6. Popular products of well known brands like Samsung and Microsoft can be yours for very good prices you will love. Harvey Norman makes your technology shopping a fun for weekend. Just browse new catalogue to save more getting higher quality. Samsung has a unique display made of very special technology. The brand is one of those who made these LED displays very popular all around the world. You can now own one of them just by paying a fair price for this quality. Besides you can find additional and essential accessories for the electronics mentioned. For example tablet PC covers. iPad and iPhone are also among what you can find on new Harvey Norman Catalogue. Again popular models of smart phones and favorite brands of customers are featured on latest catalogue. Don't forget to see other catalogues of Harvey Norman as well. Go pg; 15 for pre-paid offers for smart phones. Dozens of more products like electronic accessories, variety of headphones, sound products, storage products like SanDisk for your camera or computer, fitness electronics, Navigators, office software, modems, multifunctional printers, gaming consoles, digital cameras, DSLR cameras, and Photocentre. View new sale of Home appliances Harvey Norman Catalogue February now on the preview page. They got prepared new product range of home appliances such as washing machines, fridges. Moreover clothing, toy sale, stationery and office supplies are also among the products you can view on the new Harvey Norman Catalogue. Health band beauty sale is also featured on new Harvey Norman Catalogue. You can view new kitchen wares, electrical appliances like kettle, blender, coffee maker on pg; 2-5 in which offers are of lower prices. Compare the products with the catalogues of archive. You can find all of them Harvey Norman Catalogues. They are life savers in morning and help you start a day with most powerful form of your body. Seem more kettle, toaster and blender on pg; 2. View new sale of kitchen electrical appliances on pg; 3 as well. On that page juicing and blending products are featured while you can see food preparation items like fryers, food processors, mixers. Items of personal care Harvey Norman Catalogue are available on pg, 6&7. Good offers waiting for customers. Hair dryer, grooming kits, shavers, electronic toothbrushes, hair remover types. Coffee makers, vacuum cleaners, laundry appliances are featured on pg; 7,8,9. Washing machine types are rich in number. See also top load washers on pg; 12&13. Take fridge prices into consideration to save more if you have intention to buy a new refrigerator. See new ones on pg; 14&15. Totally 6 pages are devoted to present them. Samsung, Westinghouse, LG, Hisense 435L bottom mount fridge and many more brands are featured. For more home appliances catalogue please go to category of it. View latest You can check all Harvery Norman Online February Catalogue here. Best of fitness equipment and sports products, sports shoes are featured on the Harvey Norman catalogue available on the preview page with the lowest prices. Don't spend fortune on these sports products without owning the true quality. Visit Harvey Norman Online February sports products for the exact needs for a daily exercising equipment. The store offered one of the best price range of its for such product range. Not only fitness tools and exercise products are featured on the new catalogue but also there is home products range of the Harvey Norman. They consist of kitchen wares like knife set, saucepans, food storage and more. And toys for kids. Beside toys there are bikes for them with larger product range. See new treadmills and sports shoes on pg; 2-3. And outdoor products are featured on pg; 4. Top quality of fitness products are featured on the Harvey Norman online February catalogue with the best prices you can see at any store of the retailer. Essentials for camping and any activity of outdoor area there is plenty of the products at the Harvey Norman Catalogue of February. Don't miss out great price range of the store even you don't need these currently because when you need them they might get more expensive. A simple look to Harvey Norman Catalogue Christmas gifts December deals can make you save a lot amount. Because they reduced prices of numerous of products. Particularly in this catalogue we can view toy sale, pool offers, camping products, sports shoes, kitchen ware and more. It's a special product range for customers who are into surfing, and sports with relation to sea. Very good deals of these boards are available on pg; 10 where you can find also additional accessories.